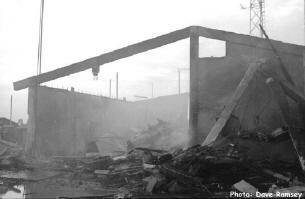 Sgt Dave Ramsey came back from the MEDCAP trip outside of Udorn to discover the shell of the once AFTN Udorn station. The remains of the RF-4 Phantom jet that crashed into the station sit directly in the center of the picture. The station tower is still standing at the rear of the station. He would have the gruesome task of helping to identify the broadcasters who perished in the inferno caused by jet fuel that exploded on impact. The sheer magnitude of the crash scene is revealed in this aerial photo taken by the 432TRW after the fires had been extinguished. The path of the pilotless plane began at the lower left corner and proceeded through two BOQs and ended in the AFTN station ( center middle). 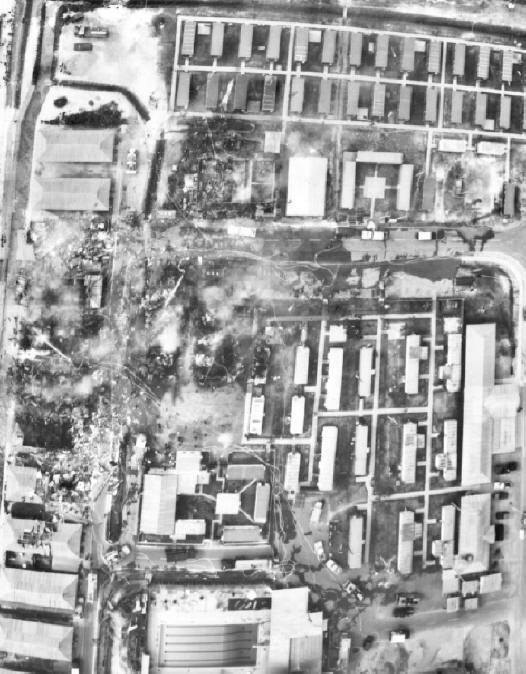 Base swimming pool is at the bottom of the photo and the NCO Annex is at center right .